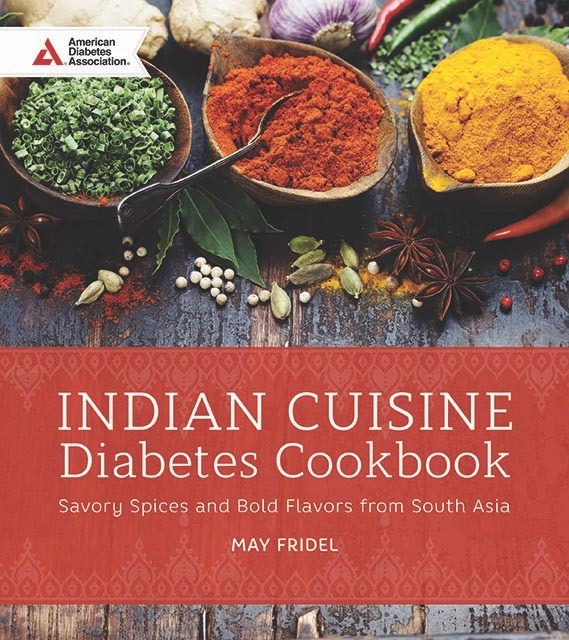 Indian Cuisine Diabetes Cookbook by May Abraham Fridel, the founder of the organic spice company, Passion for Spices, has more than 140 recipes that include main dishes, sides, condiments, one pot meals, flatbreads, drinks and desserts. Four pages in the book has colour photography of some of the recipes. Most of the recipes on this book are dishes I regularly make at home, and I liked how well the author explains the recipes. The author uses simple ingredients so anyone at any cooking level can try the recipes and enjoy dishes from South Indian cuisine and add healthy flavour to their meals. The recipes have been designed to meet the American Diabetes Association's nutrition guidelines, while having the authentic flavours from the Indian cuisine using simple techniques to prepare healthy meals quickly. Here are some of the tips the author shared in the book to help control portions and maximize flavour in our meals. Select quality ingredients such as seasonal, locally grown vegetables; grow your own; use sugar to a minimum and use natural sweeteners such as honey; wild caught sustainably grown seafood; and grass fed organic meat with nice cuts. Eat with your eyes, the plate of food should be beautiful and colourful. Plan ahead, shop smart, experiment and use different cooking techniques. 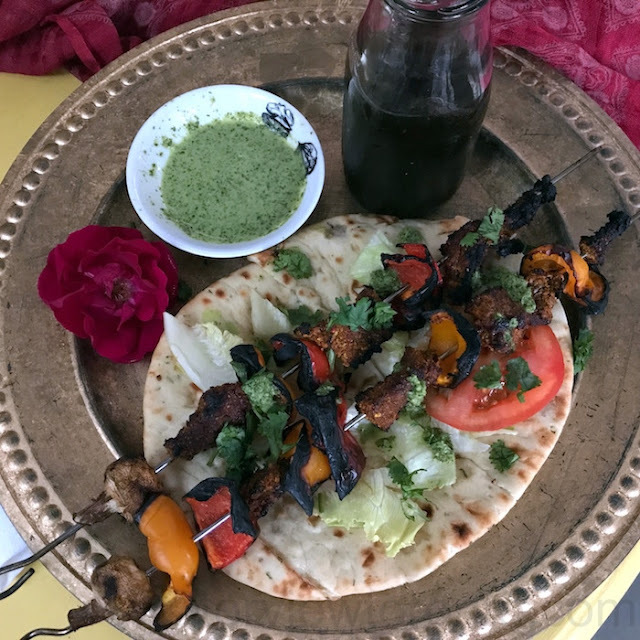 This Beef Boti Kebabs recipe is one among the few I tried that turned out delicious. If you are using wooden skewers, soak it in cold water for at least 10 minutes. I used stainless steel skewers. Mix the marinade ingredients in a bowl until well combined, add the steak cubes coat it well and leave it in the fridge for 2 to 3 hours. Remove from the refrigerator and let stand at room temperature for 30 minutes before grilling. I kept it overnight and prepared it the next day. Preheat a cast iron griddle over medium high heat or an outdoor grill and brush it with oil to prevent the kebabs from sticking. Skewer the steak and leave a little space between each piece. Brush with oil and sprinkle with salt. I added mushroom and peppers to the skewer, however I think it is best to bbq only the beef and the vegetables separately, as the vegetables can easily char. Place the kebabs on the griddle or grill and cook for about 4 minutes per side (8 minutes total) and serve hot. Garnish with coriander leaves and lime or lemon wedges to squeeze over when eating. Serve it with flatbread, and top with chutney such as mint and coriander chutney. If you are in Canada or USA and would like to win a copy of this book enter the giveaway through the rafflecopter below. This giveaway ends on July 20. Please leave comments and follow my social media networks to be eligible to win. I live in Ontario and yes I would love to try some Indian cuisine.This book would be very helpful and this recipe sounds delicious.Thanks for the fantastic giveaway and chance. I live in Ontario. I do enjoy making Indian food at home. My favorite is curried chicken. I live in Nova Scotia. I don't enjoy making Indian food, but I have friends who do, and who would love it if I were able to give them this cookbook. Sounds good! I live in the Chicago area and there are diabetics in my family. Great cookbook! I am in BC and started trying to make Indian foods about a year ago. I live in Ontario and I would love this cookbook, I am diabetic and I like Indian cuisine too, I would love to make some new dishes to enjoy!! I live in Ontario. I never tried cooking Indian Cuisine! I live in Alberta. I have made a few Indian Cuisine recipes like Butter Chicken, Samosas, Curries, Tandoori Chicken and a Chickpea dish I cannot remember the name of. My hubby is diabetic and enjoys Indian Cuisine so this book would be great. I live in ON, and I love cooking and cooking Indian dishes at home! They're always so flavourful! I'm in BC. I've only ever made Indian fried rice at home but would love to learn more. I live in Pennsylvania and my fave Indian dish is garlic Naan with yogurt curry sauce! Hi,i live in Newfoundland and the only dish i know how to make is Curry Chicken and we love it ! I live in NL and would love to try some Indian recipes. My husband is a diabetic. I live in BC and I love eating Indian cuisine at home - my husband and my stepdad love to cook it. I live in Manitoba and do like making Indian cuisine at home especially curry.